FIAT Chrysler Automobiles India will be organizing a Drive Cool Campaign for all Fiat customers at exclusive dealerships nationwide. This activation will mainly focus on keeping air-conditioning units functioning at their best. Fiat Drive Cool Campaign will aim to reach out to a wide base of customers across the nation. The privileged customers of FIAT will enjoy a variety of benefits through the Drive Cool Campaign. FCA India will be offering special discounts on spare parts along with special discounts on reverse parking sensors, free car check-up, free top wash and 10% discount on labour (only on mechanical repairs). 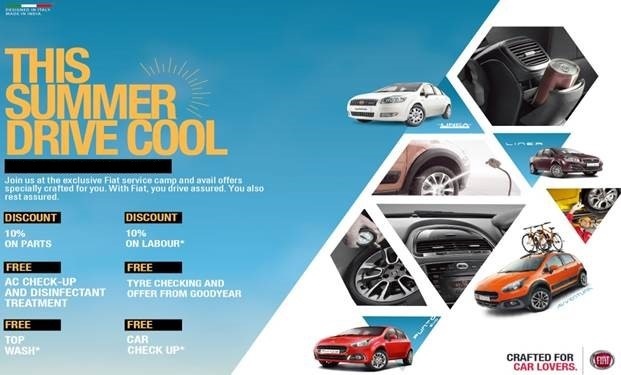 The Drive Cool camp is a part of our extensive strategy to connect Fiat owners to the brand and also an effort to strengthen our relationship with our valuable customers. This camp is a step towards our efforts to enhance customer engagement. We are committed to provide world class products and services to our customers and 100% customer satisfaction remains our constant endeavour.